We think this is one of the best Transmission Jacks of its type on the market in New Zealand. 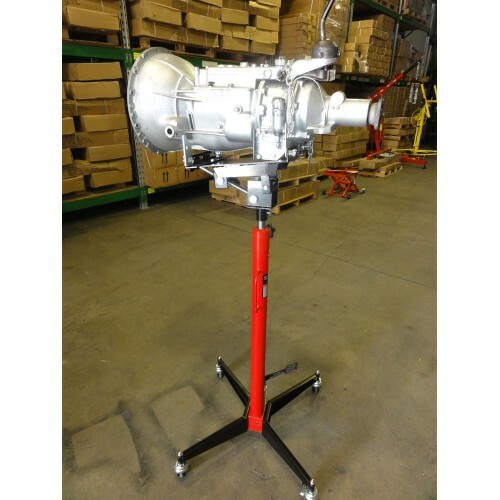 Rated at 500kg... which is more than enough for most automobile gearboxes that we know of... this Jack will assist you to remove and of course re-install gearboxes... and Differentials , transfer Boxes and the like to the underside of most vehicles. Standing on four cast iron wheels the machine stands firm. The foot operated Jack is exceptionally easy to operate and lifts the saddle of the machine to a height off the ground of 1850mm. The lowered height is 1050mm.... and of course the Gearbox/ Diff sits on top of that. The equipment that you are lifting / lowering is secured onto the saddle using an adjustable chain system. The Saddle is able to be tilted 60 degrees forward and 10 degrees backwards to allow you to line up the gearbox etc. The Load is lowered via an easy operated hand twist knob to give you precise control. A quality machine to make your life easier and Safer!! If we are delivering to your location , please also note that some lifting may be required when off loading the unit. For Commercial as well as home use... this lifter will be an asset in your workshop for many years to come. Assembly is required, and the instruction leaflet is comprehensive but without good English. Purchase with confidence from fellow car enthusiasts......People who know whats needed and how to use the tool correctly. Of course.... the Gearbox is not included!! Please include your Telephone Number with your email Address when requesting delivery. SPECIAL NOTE : All Units require shipping unless you are picking up from our Depot. Please use the email / contact us facilty when going through Check out to enquire about this.